There have been 64 images uploaded to this topic. (View topic image gallery). There are 224 posts in this topic. You are on page 1 of 5. 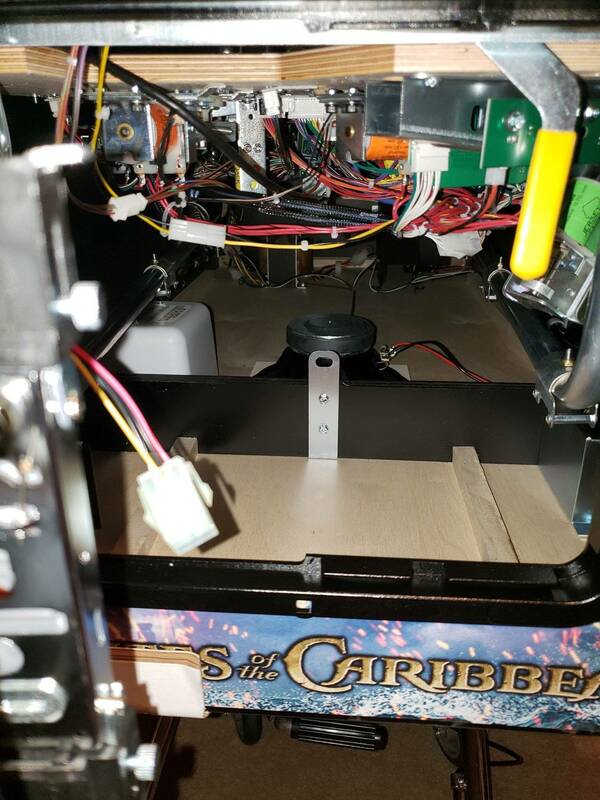 This thread is to share tips and solutions for Jersey Jack's pirates of the Caribbean. I'll curate it with an index more specific than key post listings. DISCLAIMER: These fixes are shared in the interest of helping others correct issues. Performing any repair is at your own risk, and should be done by experienced and careful individuals only. Contact your distributor first for help, before filing JJP support tickets. They are there to help you and will generally respond quicker. vireland last edited this post 4 days ago. PROBLEM:Where the heck does the Map2 piece that comes with the jjPotC Cliffies go? SOLUTION:When installing the cliffies, the MAP protector is a two-piece set. One protects most of the surface area around the hole and targets, and the other protects the back of the hole. ...then put the ball guide on the right on top of that stack. Then I put in the post and screw to hold the deflector, paying attention not to tighten overly tight and also to orient the deflector to similar orientation to when I took it off. Installed the map Cliffys last night and it went very well. 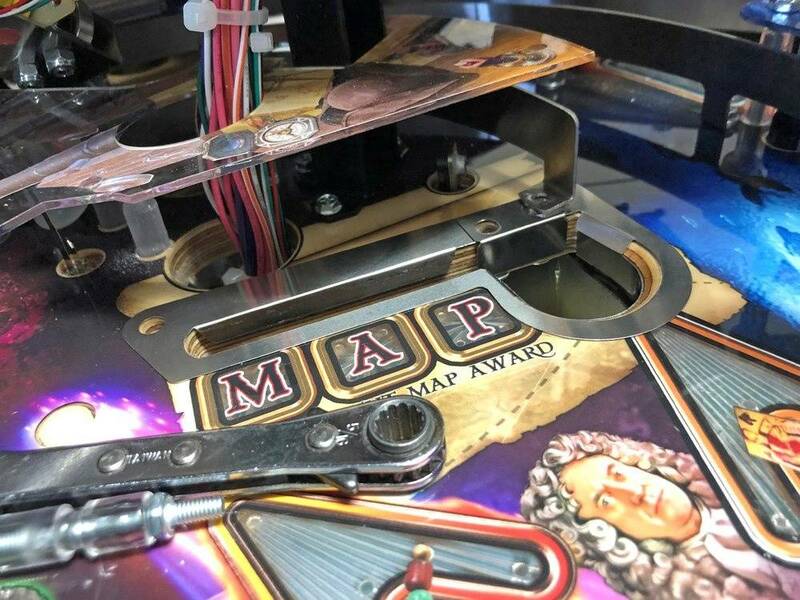 Make sure the entire map Cliffy is flat against the wood once installed (use included alcohol swab to clear area first), the map 2 Cliffy goes on top followed by the angle bracket and then the ball guide bracket. 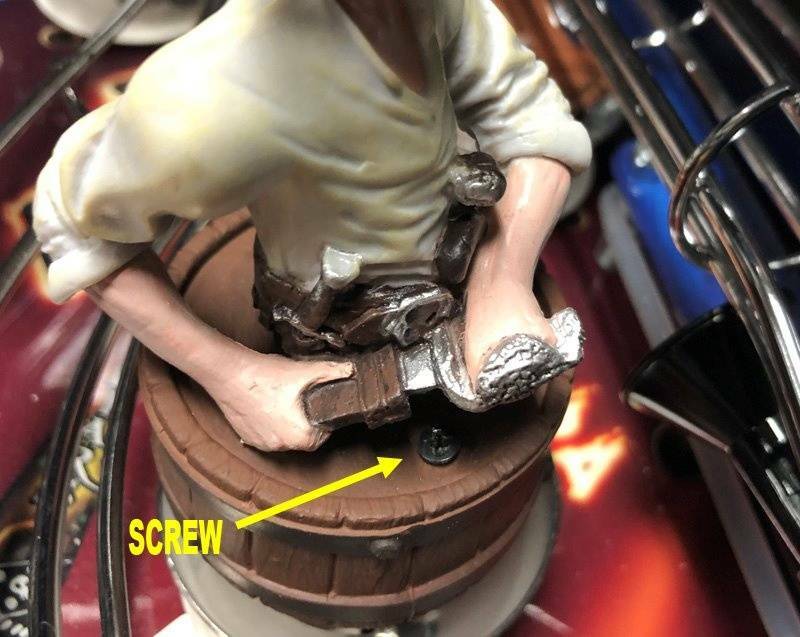 Check out the video below from Buffalo Pinball for how to remove the ship. 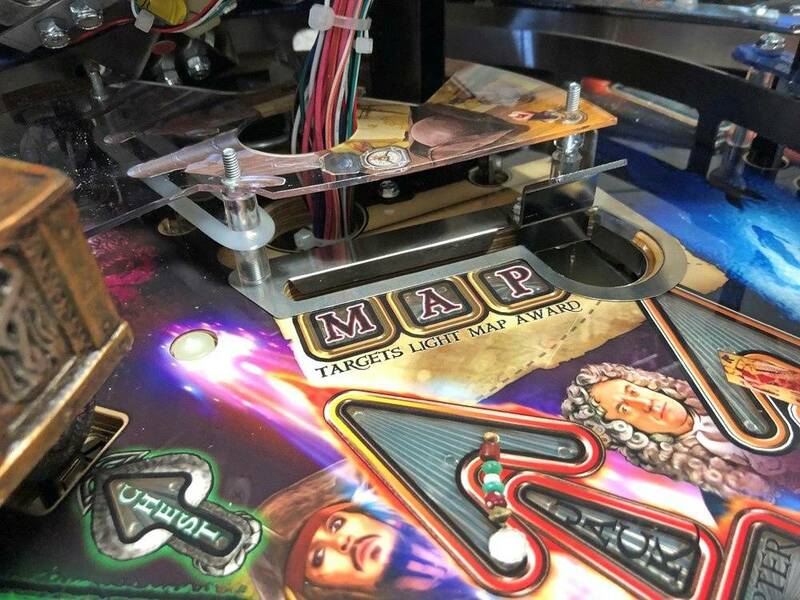 PROBLEM:You're having problems putting your playfield back down that last 3/4"
PROBLEM: The shooter plunge is inconsistent. Sometimes it can barely get the ball onto the playfield. 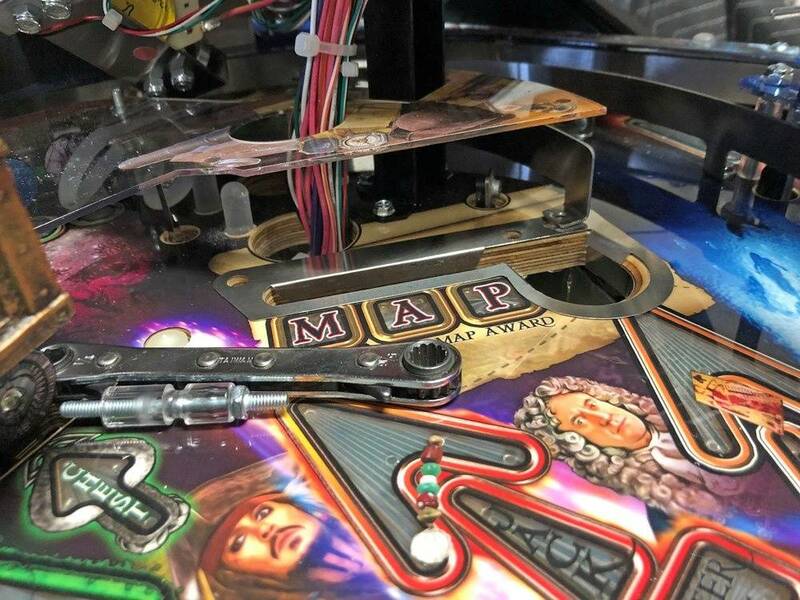 SOLUTION: Likely your playfield is hanging too low and the auto launch bracket has dropped very slightly into the path of the shooter rod, robbing it of energy, causing weak plunges. You can test for this by watching the window that lets you see the shooter tip and spring on the shooter rod. 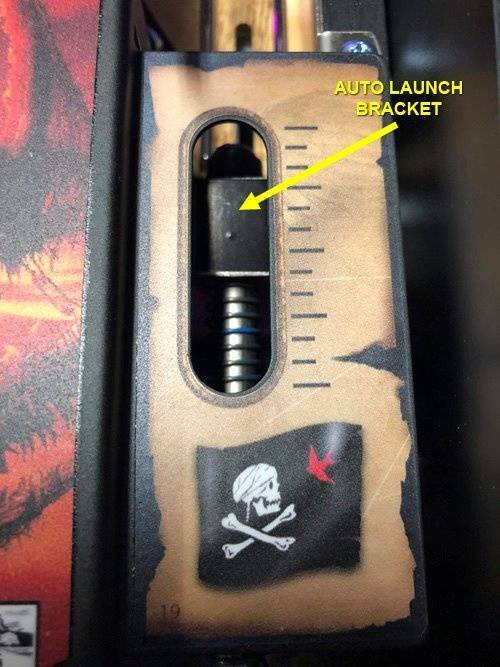 The auto launch bracket is visible through this window on the top, running over the shooter rod. Do a full plunge and see if the auto launch bracket moves - it should not move at all. If it moves, even every few plunges but not all of them, then this is your problem and there are two ways to address it. 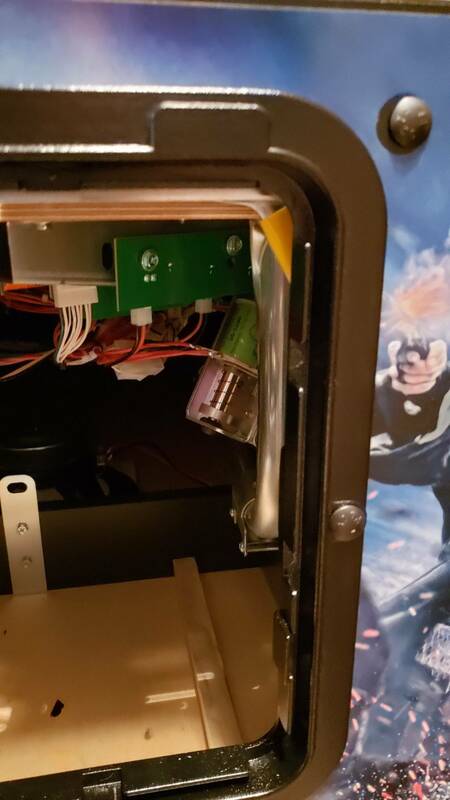 METHOD ONE: Shim the hooks where they connect to the playfield with a thin piece (1-2mm is plenty) of metal, plastic, or dense foam so it raises the playfield very slightly and in turn clears the path of the shooter rod again. 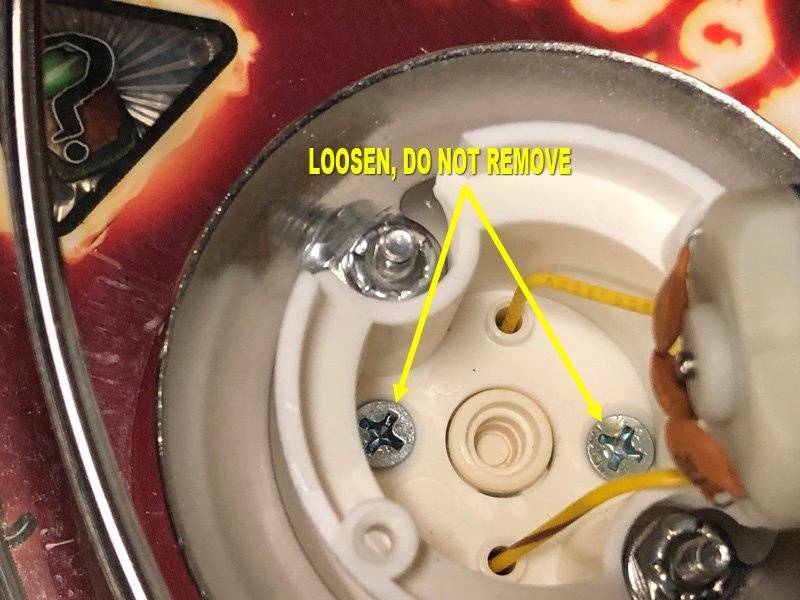 The yellow area is where you want to put the shim - it goes UNDER the hook ON EACH SIDE (to keep the playfield level), then the hook is put in place on top of it. 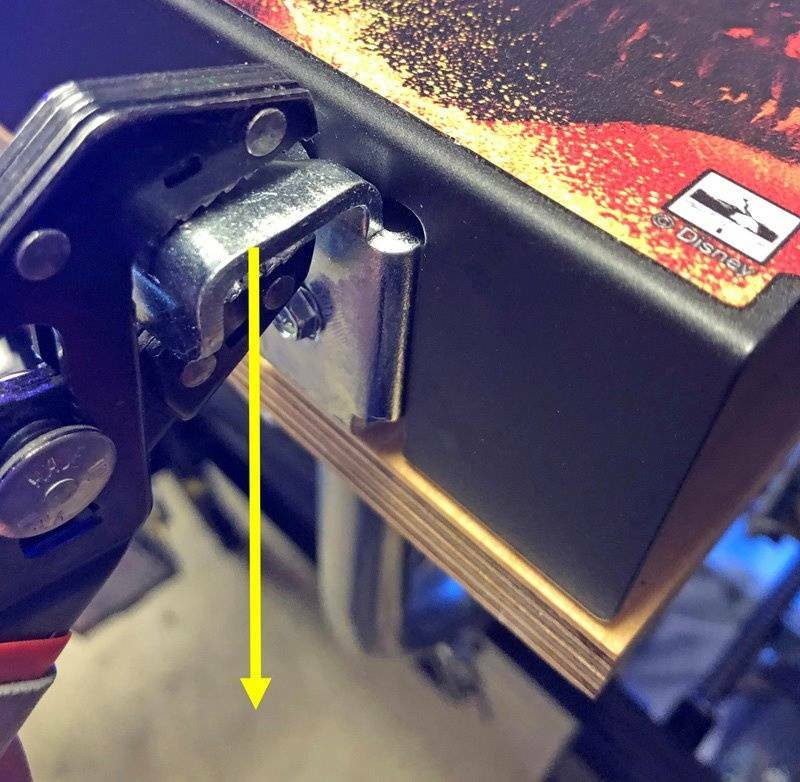 METHOD TWO: Bend the hooks slightly down where the connect to the playfield using a robo-grip pliers or something like that. Don't go crazy, a small bend is all you need. SOLUTION: The EASY solution is to manually move the ship and hit the target using your hand. 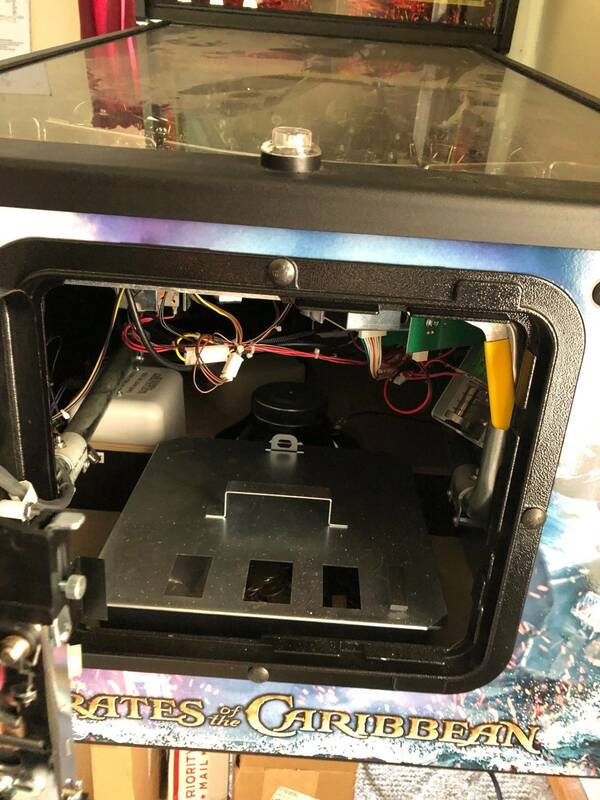 The software will report a problem if a switch is not activated within a certain number of balls, so it may just be that you haven't had a ball in the cannon in a while. Moving it manually will clear the error as long as the switches work. If that's not it, one or both switches need to be adjusted. 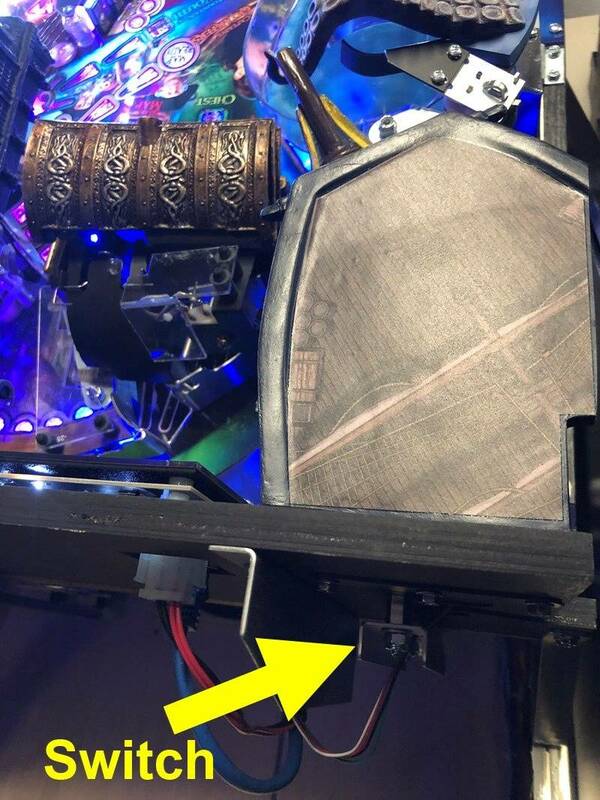 The switch for error 48 is BEHIND the backboard at the bottom, and activated with a lever attached to the ship. The bullseye (destroy) switch is inside the ship, but the wires run out through the back. 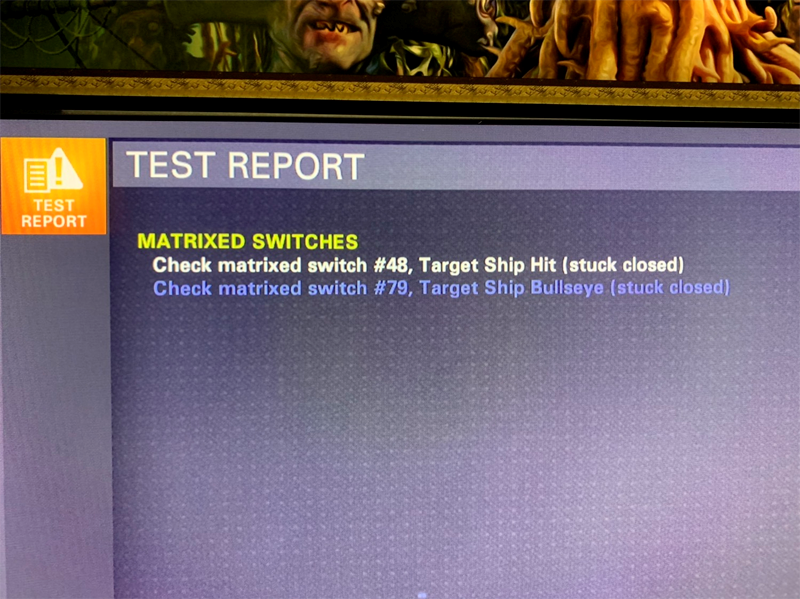 Switch 48 is always ON and "activates" when the bar attached to the ship moves away allowing the switch to be released and in the "OFF" position (the reverse of what you would expect. First, examine the switch and tug carefully on the wires to make sure you don't have a broken wire. If the wires are okay, go into switch test mode and make sure the ship moves freely, and that the switch activates when you move the ship by hand. If it doesn't watch the switch carefully to see if it opens enough to register, if not, loosen the switch and adjust the position or bend the leaf. PROBLEM: Chest seems to reject shots that it should have captured. SOLUTION: There are two possibilities. The forks may be loose, or the forks may be bent, directing the ball into the sides of the chest entrance and bouncing back. Check the forks first - remove the fork mech (the one that raises and lowers the forks) from under the playfield (5 screws.). Tighten the two screws for the fork which are likely loose. This is a common problem. Recommend loctite (blue) for a more permanent fix. If tightening the forks doesn't work, if you have a phone that will do slow-mo, record in that mode and have someone take the shots to the chest. Watch what the ball is doing. If it's not coming toward the chest opening in the center, take the fork mechanism off the bottom again and bend the fork tines (one or both, depending on what's needed) the direction that will guide the ball to the center of the opening in back. ADJUST A LITTLE AT A TIME AND ADJUST THE WHOLE FORK TINE, NOT JUST THE TIPS. Note in this gif that the fork tines you can see through the opening are pointed to the left, and the ball is being thrown to the left side of the opening, then bouncing to the right and dropping back out. The fix here was to straighten the tines so it threw the ball towards the center of the opening. Oh man! These are fantastic detailed posts! Really glad you took the initiative and put in all this work. Thank you vireland and zaphx! And everyone else that has helped bring/correct these issues along this long road. PROBLEM: Balls getting stuck at the top of the Black Pearl ramp. SOLUTION: Ensure the game is horizontally (left to right) level, measured at the playfield. Next, locate the screw to the right of the ramp which compresses a rubber crush washer. Tighten this screw clockwise until setting balls on the top of the ramp always makes them roll away right. Do not over-tighten or the screw can break in the post! If this fails to resolve the problem, remove the rubber entirely. If this still fails to resolve the problem, put a clear cabinet bumper under the Pearl ramp to lift the left side a bit. You want the ball to roll off to the right easily no matter how gently it is placed on top of the ramp. This is a very common issue and easily fixed. 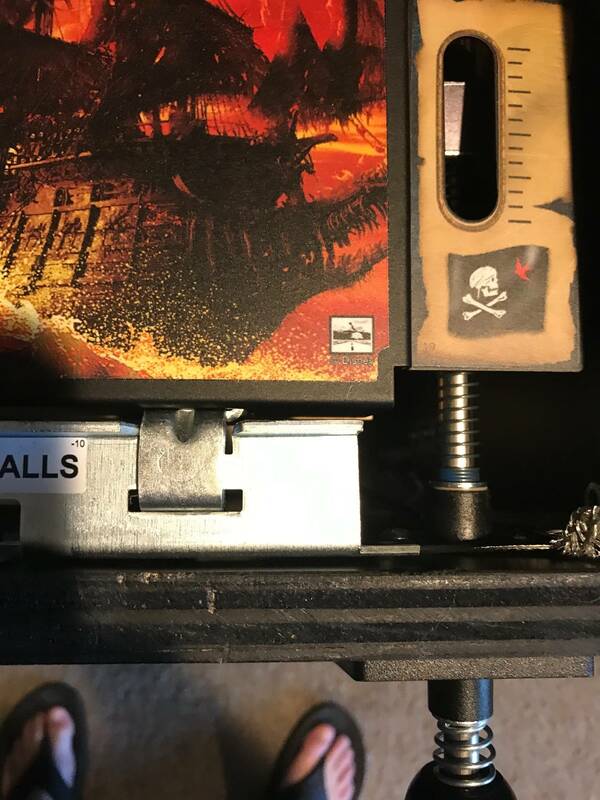 PROBLEM: The Black Pearl rocking motion sometimes halts (especially during the cannon shot) or otherwise seems to struggle in the calibration test. SOLUTION: Put the playfield in the first service position, such that you can observe the motion of the arm. Run the ship calibration test. 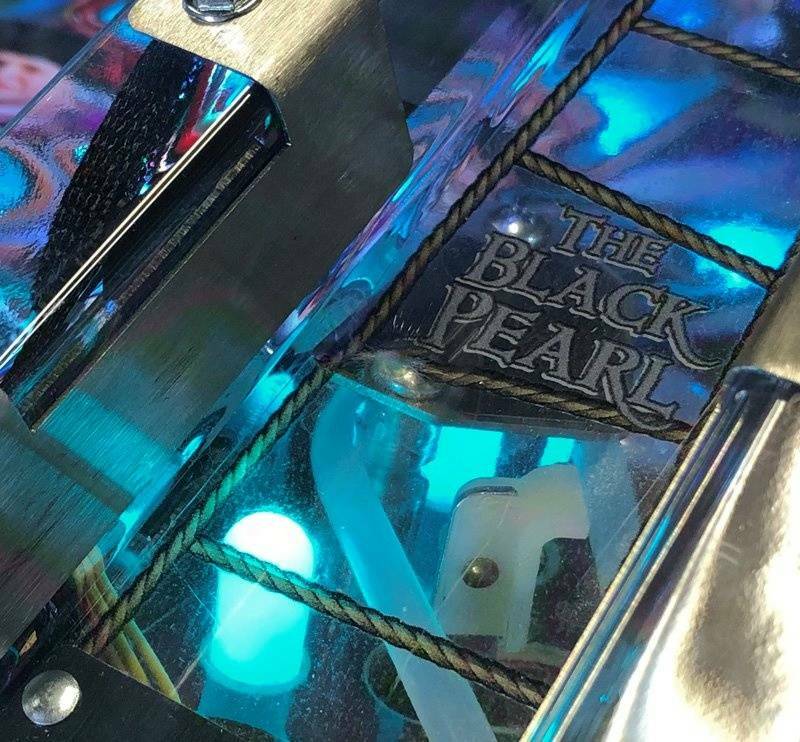 If the pin that controls the rocking of the Pearl contacts the top or bottom of the slot, loosen the two screws on the control arm and correct the height travel is unimpeded in both directions. This took a bit for me to find, but after correcting it the calibration was able to run all the way down to 4, and the ship rocking was much more playable. 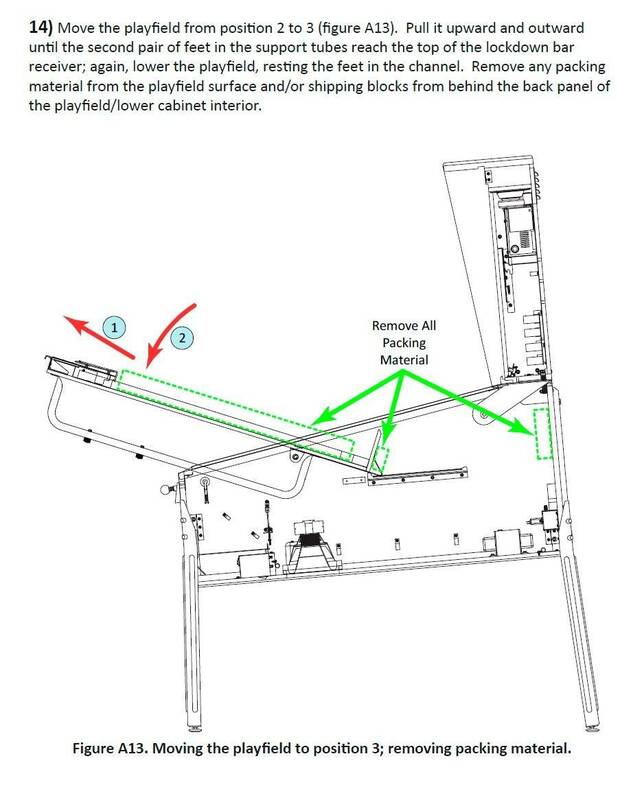 SOLUTION: Take pictures of the shooter lane before removal, noting the angle of attack into the right orbit. Remove the shooter lane. 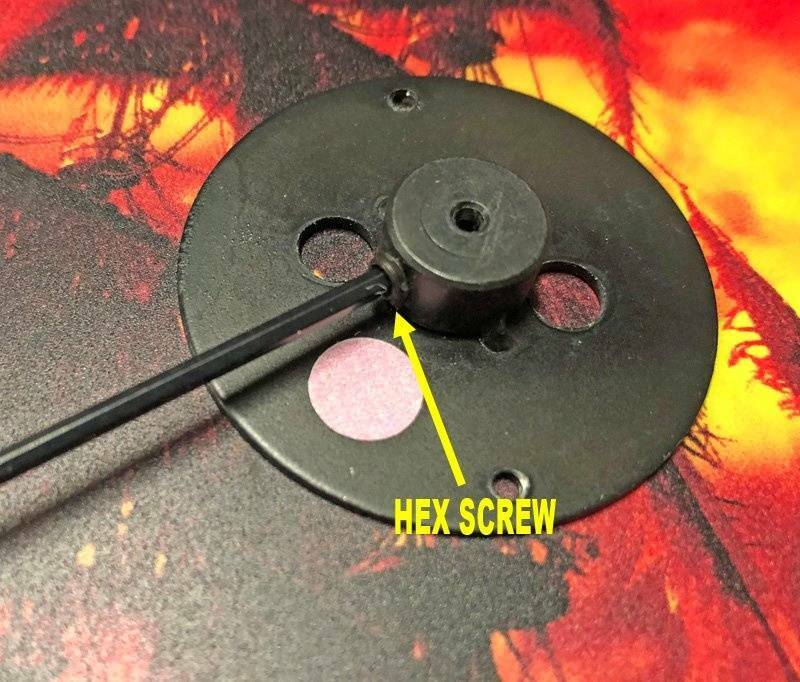 It has 3 connection points, one hex screw near the top, the “stack” which holds the right strobe, and a small black screw near the bottom. With the wireform removed, gently bend the bottom two forks such that they are slightly down and slightly apart. The goal here is to make them hug the shooter lane when reinserted. When reassembling, take care not to strip the black screw. I was advised to put the screw in and gently turn counterclockwise until it rises up, to ensure it hit the threads correctly on reinsertion. This fixed the problems with the shooter completely. PROBLEM: Switch (any switch) isn't registering. SOLUTION: Activate/deactivate the switch while in switch test mode on the system menu and see if the switch works at all. If not, remove the switch and carefully examine the small plastic trigger at the end of the switch arm to see if it's stuck in the down (or up) position. If it's stuck, try to work it free. If you can get it moving, likely it will stay functional. Sometimes they come with a little extra plastic from the factory that prevents proper operation. SOLUTION: There are two possibilities. Targets under the ship may be mounted too close together, causing them to hang up on each other. Each has two screws holding it to the playfield. 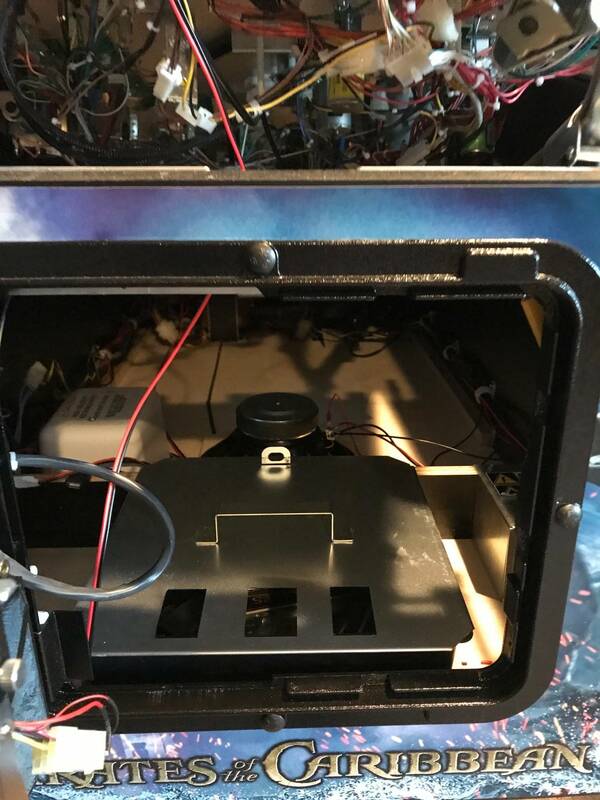 Loosening the screws (don't remove) under the playfield for the targets and re-set them slightly further apart. If the targets don't look too close together, the leaves for the switch may be too close together making the machine think the target is continuously being hit. Put the game in switch test mode and press each the M, then the A, then the P targets to see if any don't register. If you find one not registering, slightly PULL that target toward you and see if that causes the switch to register. 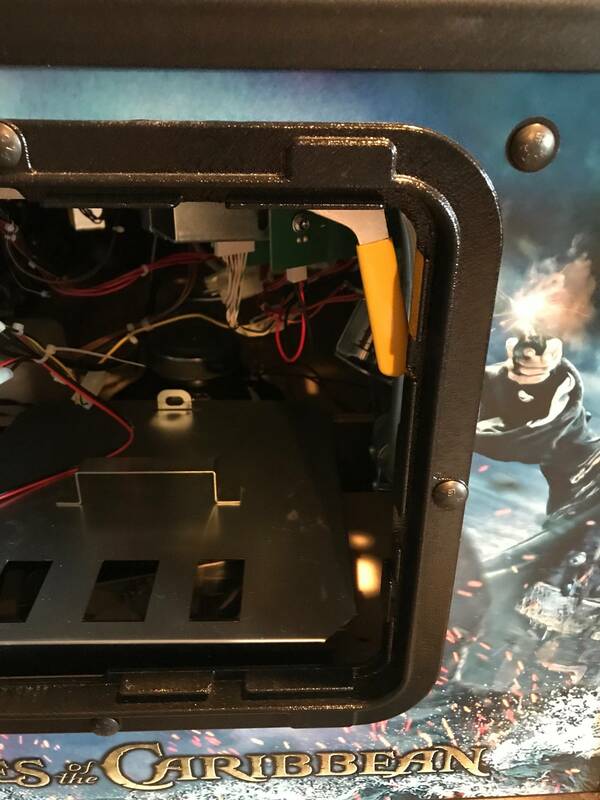 If it DOES, power off and remove that switch from under the playfield and adjust the two leaves of the switch further apart so they're close but not touching. Re-assemble and test the switch by pressing it in switch mode. SOLUTION: The L target may be getting caught under the wiring harness on the Pearl ramp. Loosen the target and press the harness up and out of the way, then reinstall. The Pearl ramp adjustment to stop the ball from sticking on the ramp also may help. 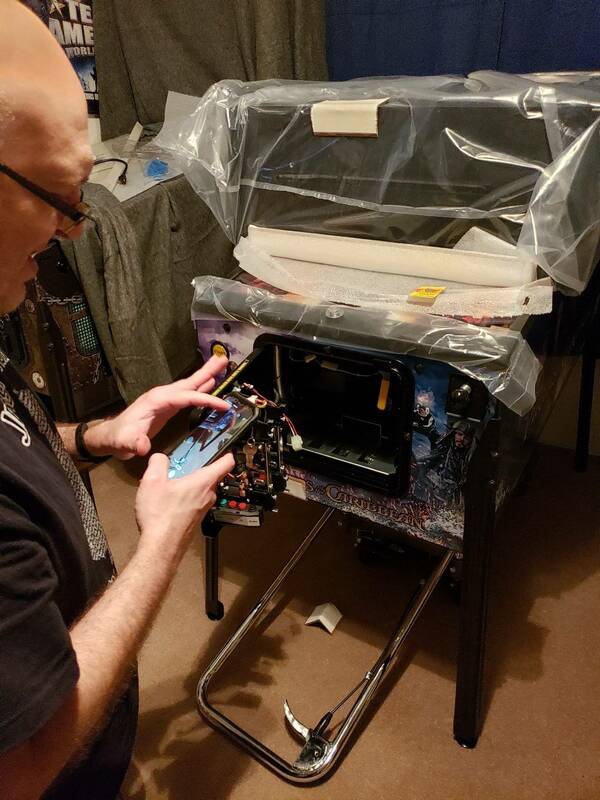 SOLUTION: Locate the post mechanism(s) under the playfield. Adjust the position with the screw and lock into place with the hex nut. Consider blue loctite to prevent recurrence. Let's add the loose flippers for the Black Pearl as well. Let's see how successful this ends up being. I think the natural transition will be a slow one over the next several weeks/months, but hopefully successful in the end. We'll probably have to keep re-directing people over here. The post that has this link in it (in the other thread) should be a key post. Thank you for compiling this! This thread is already on fire. Duly noted and edited! (I've properly flogged the person posting on my behalf with an oversized mackerel!) It's amazing how much effort zaphx put into that spreadsheet! He spend months compiling issues relentlessly! We've got some really solid techs in this thread! Reminds me of the many awesome helpful folks in the Houdini thread also! Yes. A lot of them are from the list he compiled. I invited him to post the info he had compiled and I'd link it, but he's burned out on PotC tech, so he said I could do it for him, which is fine. I just want to get all the info in one place and add pictures and video where possible. Curious - are there known build date ranges that are prone to more issues, or newer build dates that point to factory fixes for things. 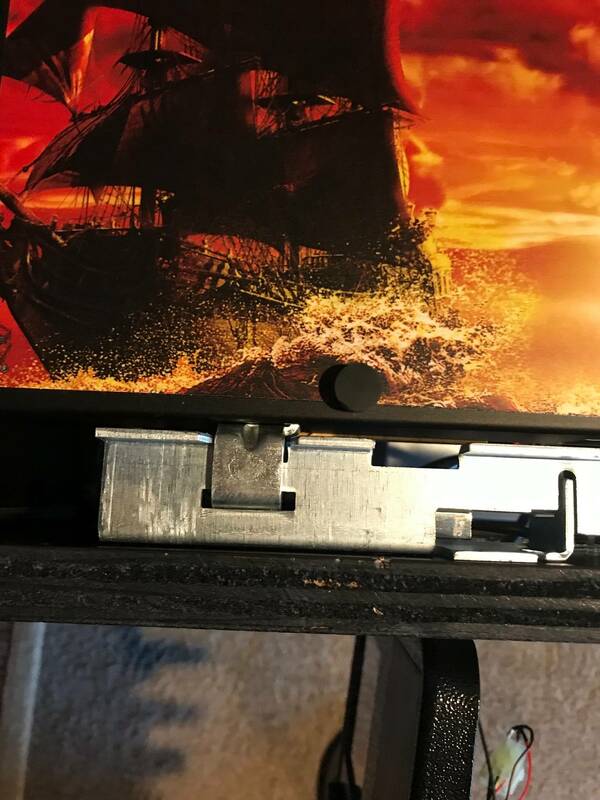 I am looking at a POTC new in box that was built 2/13/19 - is that any indication of QC? It feels like they're rushing these out the door to get to Wonka with minimal QA (at least not the usual level of JJP QA I've known in the past), so I don't think the date helps much. The one we got was 2/11/19 and it had a bunch of issues to correct out of the box. Nothing hard, just a bunch of niggly things that would have been obvious if it had been played. I'll get there. It may take a week or so to get everything in, and maybe even longer if I take some illustrative pics or video to add to specific ones. I have one of the December builds and can happily say that I have only experienced the loose fork ramp issue. It took less than 5 minutes to fix...just tighten two screws. All other frustrations have been due to my own screw ups while installing mods. I'm only on a couple weeks of firsthand stuff here, so I can imagine he'd be pretty drained in this area. He was working on those for months it seemed. You've been doing an excellent job yourself all along as well! I know that other user had some great map and tortuga Cliffy installation too! Mine was 1/21/19, and so far hook alignment issues and sagging monitor. Not bad, but not anything that should ideally exist for a new owner. 2/4/19 build here and thankfully no major issues. 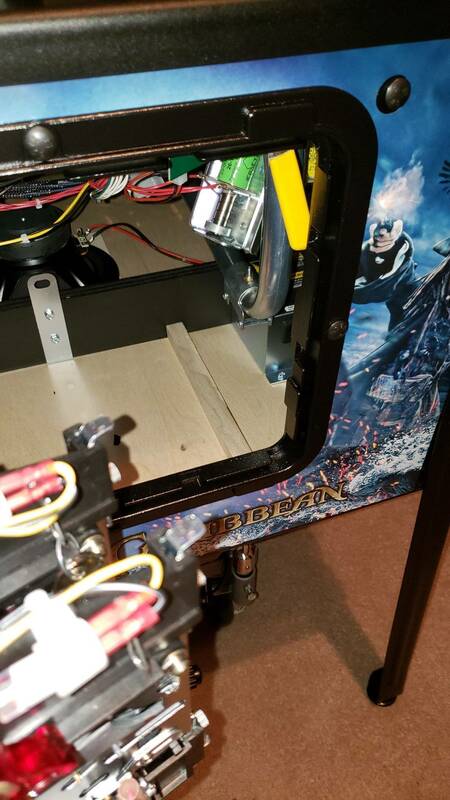 Even took the ship mini playfield off and back on to install the map hole Cliffys, still no issues. First off, kudos to vireland for the great thread, this is sure to be a great resource for all JJPOTC owners. That is all I can think of. Great game, glad it was my first and only NIB!!!! Adjusted the ship removal link to this direct-link post instead. Thanks. It still ends up failing fairly frequently. 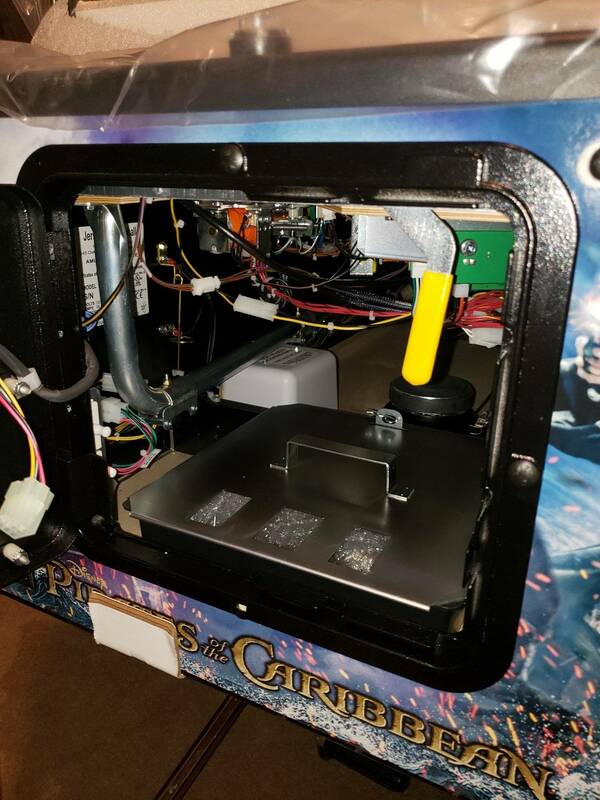 SOLUTION: Remove the Black Pearl and look for broken wires underneath. 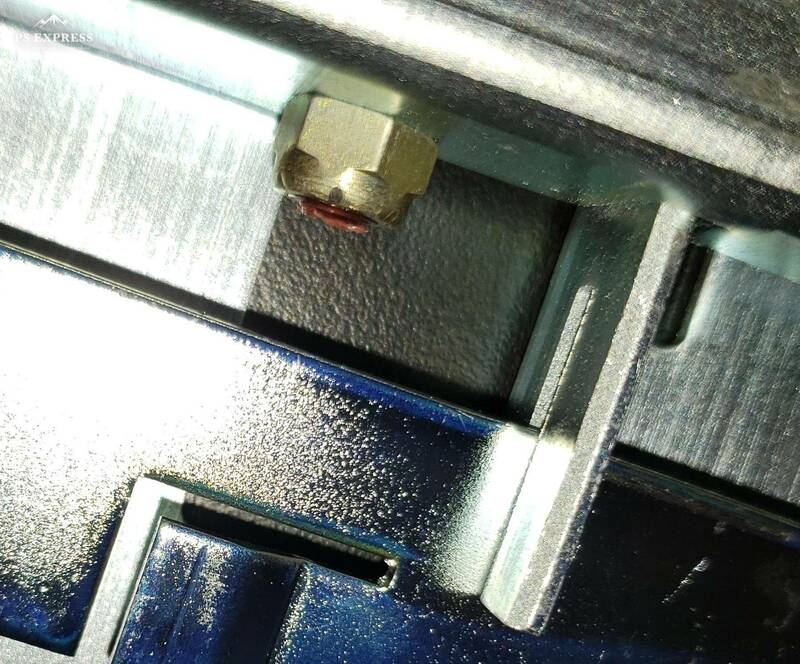 In one case, the green/brown wire at the Bonus target was broken off resulting in switches 9, 10 and 12 failing (because the switch wires are daisy-chained, one wire broken upstream can break everything after it on the chain). Resoldering broken wires corrects the problem. 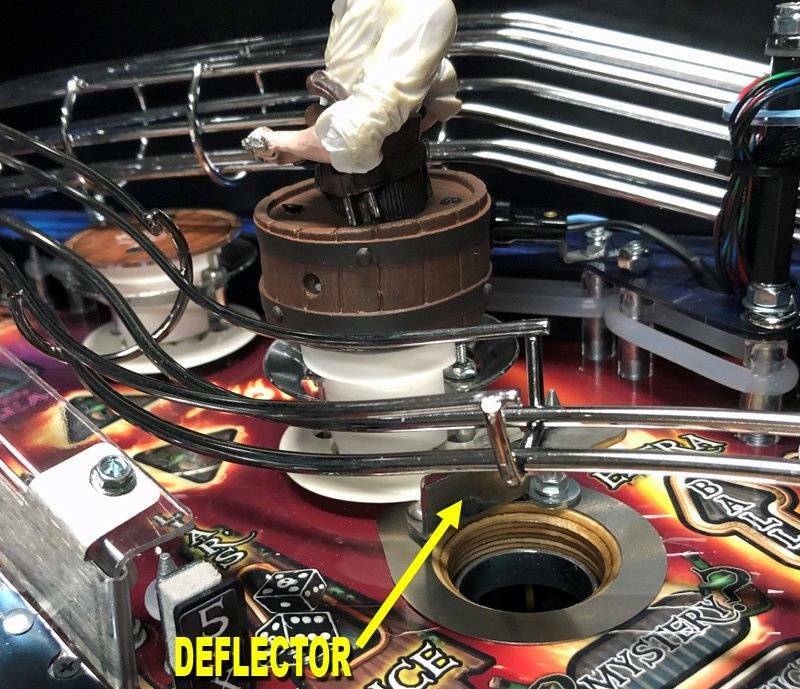 SOLUTION: Most likely the ball deflector/guide at the back of the Tortuga saucer is loose or mis-aligned. 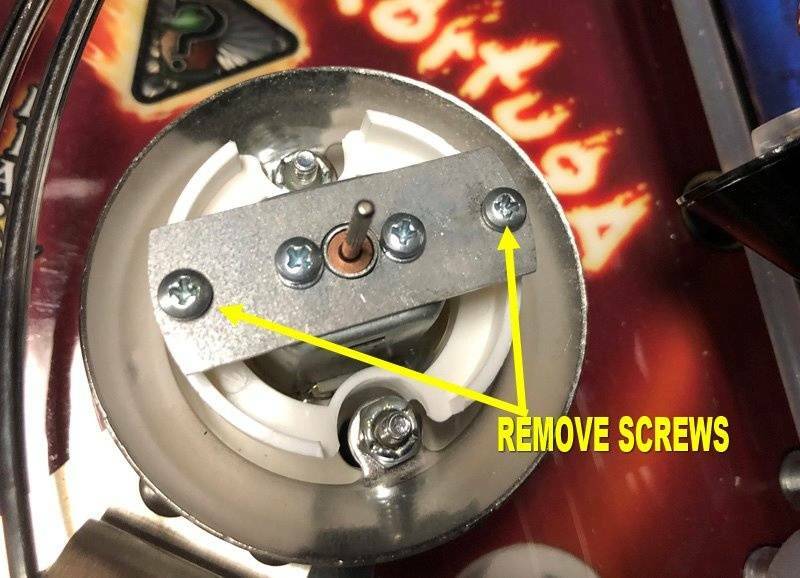 Remove Tortuga Tom and loosen the pop bumper to gain access to the two phillips screws for the deflector that's slightly under the pop bumper skirt. Aim the guard a bit to the left. Test and ensure the scoop fires into the middle of the left flipper. Consider blue loctite to make the fix permanent. Reverse the process to put it all back together. PROBLEM: Spotlights flickering and/or going out. SOLUTION: You may find that twisting or manipulating the spot brings it back. Avoid twisting it, as this will make the situation worse. Instead pull the bulb directly out. 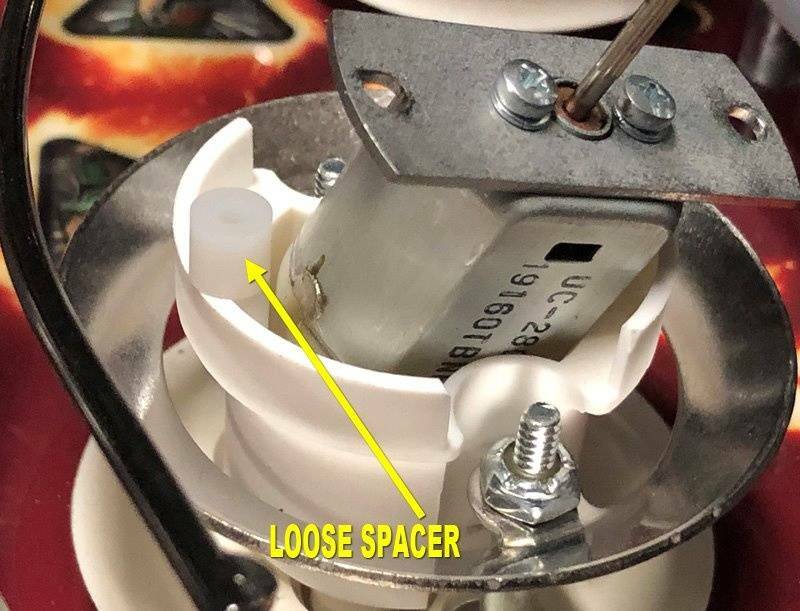 The diffuser cap may separate from the bulb housing, which is easily fixed with super glue. Once the bulb housing is out, note the two wires folded up onto the base of the bulb. Smooth these out and make sure they are mostly straight and covering both sides of the edge. Reinstall, gluing the diffuser on if it separated. I also have a December build (12/27) and honestly...it's really solid. Just a couple things here and there, but nothing "major" at all. I will note that it's a CE...not that it should matter. The one I played on site was doing this! No wonder! Now it makes sense. It's not "supposed" to. I can't remember who, but they had used zip ties on the coil, hoping to take the play out of it and that helped a little. But is still doing it! Unless someone else comes up with a fix, I will have to tear it apart and really get a good look at it when I have the time. I will see if I can squeeze a e clip in one side and see if that helps. When you say "failing" does that mean can't get it around the top of the playfield or can't get over the hump onto the playfield? Have you slo-mo recorded the auto-launches to see if it reveals something robbing the energy from the launch? I don't suspect a Titan plunger could help in any way other than durability. Maybe it actually "feels" better? The auto-launch doesn't use a plunger, it's the two forks that are activated by the coil. Okay then. Replace the forks? Maybe? Probably just need to adjust the position. Maybe. But on my shooter wireform there was a clear point of contact robbing energy from the ball. I could feel the ball hitting one of the flat support wireforms hard. And another one very slightly. Knock on wood but that was 100 percent of my shooter issues. PROBLEM: Screw on top of the post from the sling under the Black Pearl ramp is pushing into the ramp, deforming it with a dent. You can see it in this picture, just below the "P" in "Pearl," tearing the ramp sticker a little and pushing up deforming the ramp with a bump. 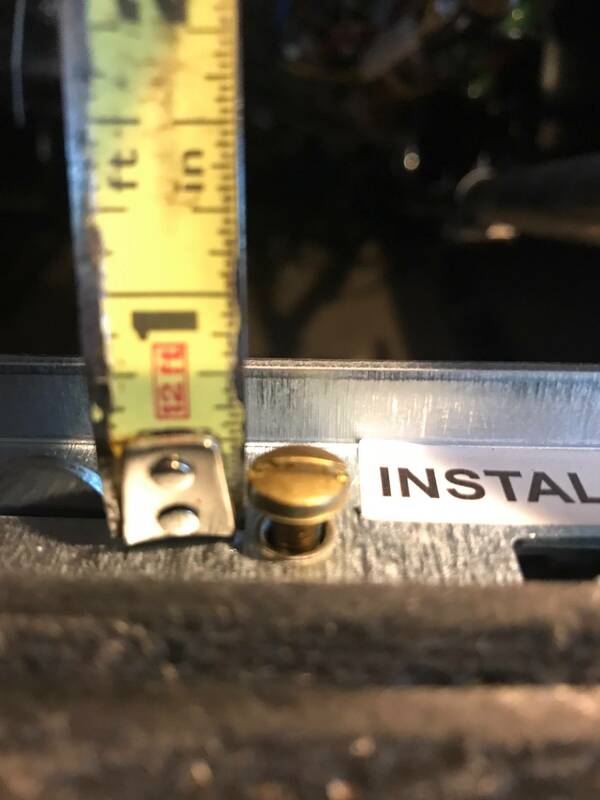 SOLUTION: The post in question really should have been a metal mini-post from the factory to allow proper clearance for the ramp above and still allow tension for the slingshot below. 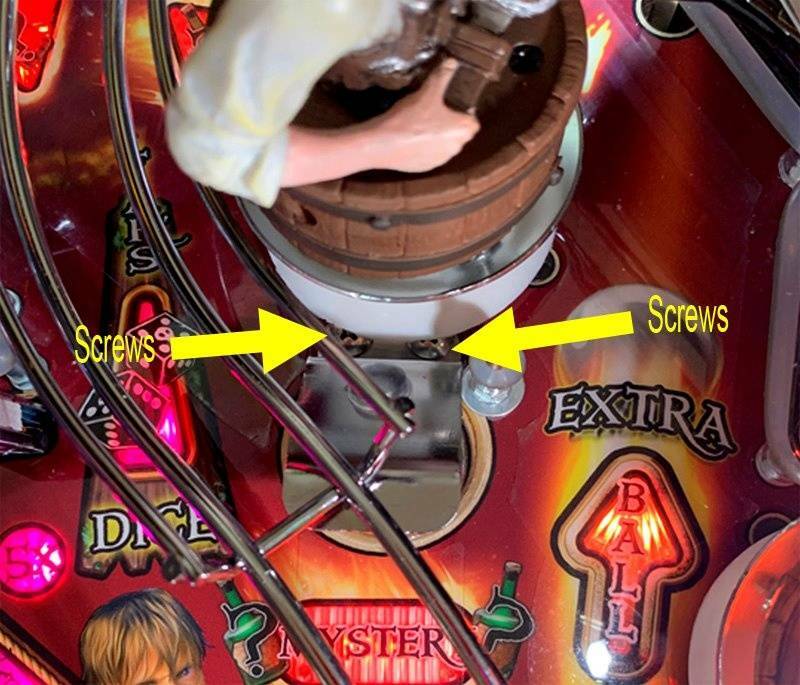 As it is now, you can back off the two #1 philips screws at the entrance to the ramp to release some of the tension on this screw, but not too much because you want the ramp to still be solidly connected to the playfield. If you're feeling ambitious, you can try swapping in a mini-post instead. Has anybody done the mini post fix? 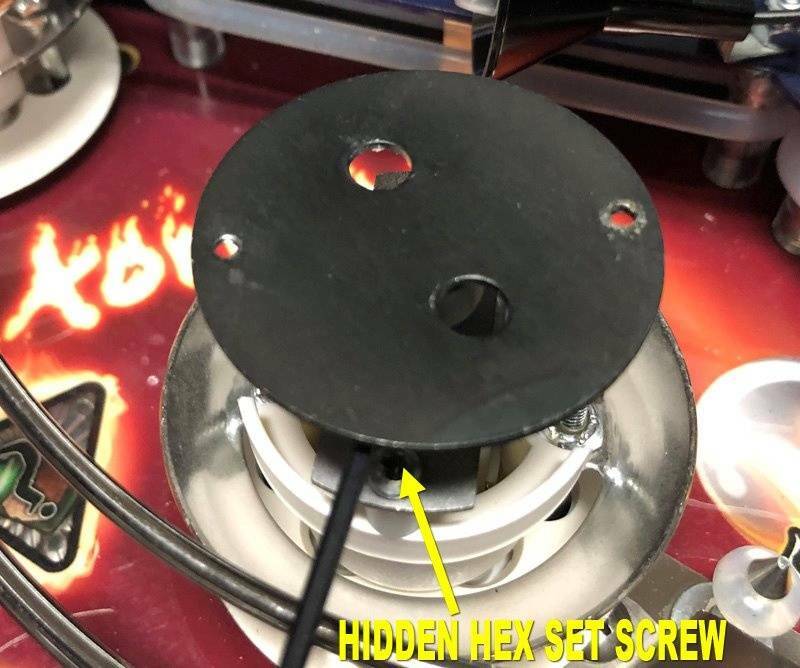 I am not sure how well the metal bit that the screw goes through would then be connected to the playfield? Maybe I am picturing the wrong replacement part. Does anybody have a link to the mini post they used? 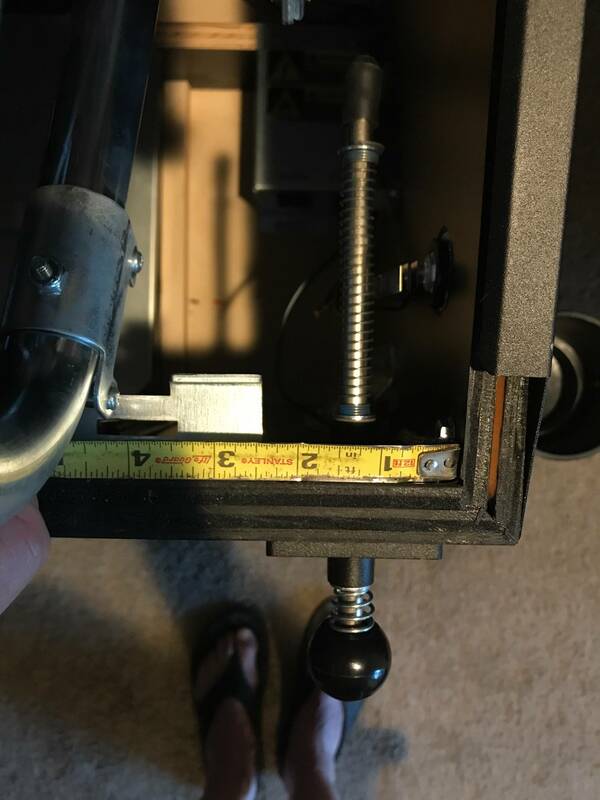 Is it a wood screw or a threaded base? 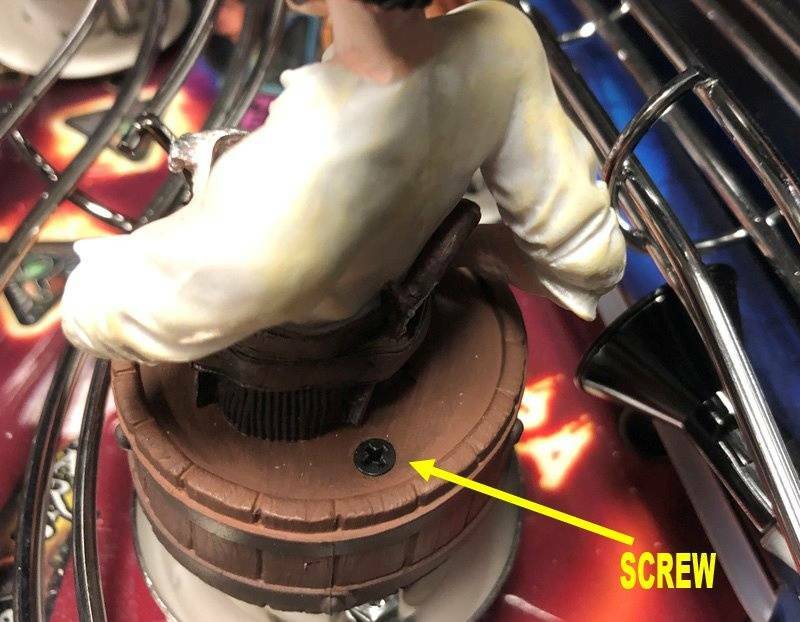 This was a great heads up, I was not aware of this screw being an issue. 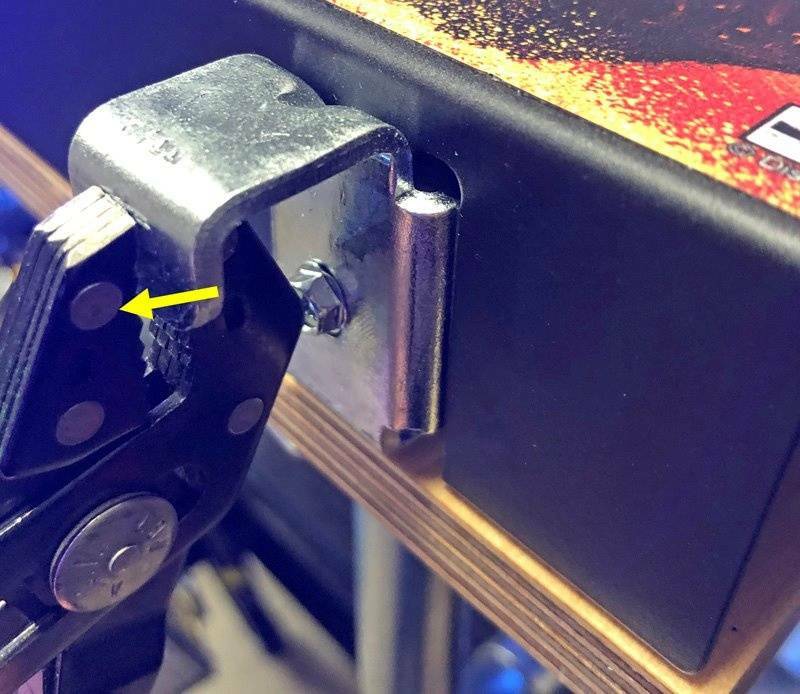 I will probably try it, but I haven't removed that post yet to know if the existing plastic post/screw combo is going into a t-nut (machine threaded) or right into the wood (wood screw). 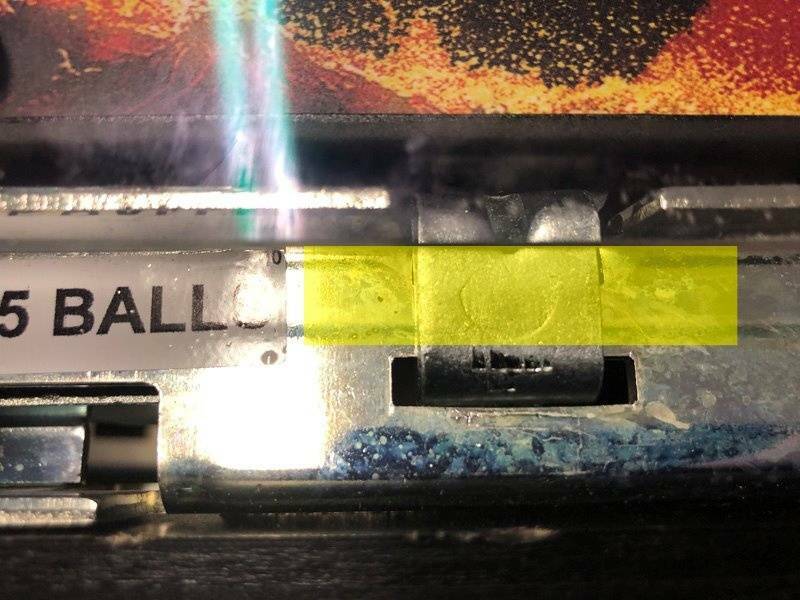 The only thing that's dicey is that will make that small metal cover only connected on one end, so it will have to be very tight so it doesn't move. It's a bonus that it's not plastic, but even with it being metal, it can still swing around from hits and vibration. So that's a problem to solve. But I think a mini-post is the answer, I just have to figure out the details.